In a world where technology takes over and ATMs lead the charge!!! An alien invasion story like no other!!! I found this to be a quick and very interesting read that takes a different turn on alien invasion stories!!! Normally when we read about sci-fi and alien invasions we think green monsters or intergalactic soldiers defending earth against the universe.. this however treats an alien invasion as a colonisation – and to be honest, I can’t see how different this story is from the real world!!! A world where robots will take over and ATMs will lead the charge to help the economy and automate literally everything!! So where does automation leave families? Following the main character, Adam who is an artist and is battling what he calls an embarrssing illness. He takes it upon himself to support his family in an age of high unemployment in light of this technological invasion and the only way to get ahead is to be part of this alien reality tv show. The plot was quite unique and the story was quite cleverly executed. I found this to be a very fast paced read, all the while thinking – actually, this is happening right now!! I recommend this to readers who enjoy contemporary with elements of sci-fi. Many thanks to Walker Books Publishers for sending me a review copy in exchange for my honest review. Synopsis as seen on Goodreads: In the city of Berren, strange things happen. People disappear, trees sprout overnight. But no one believes in magic. To believe in magic would be disloyal…The devious Lord Rump and his granddaughter, Duckling, need a disposable boy, and Pummel, a farm boy looking for work in the city, fits the bill perfectly. Duckling is happy to tangle him in her grandpa’s web, as long as Grandpa keeps his promise – that this will be his very last Scheme. Lord Rump’s intrigues take both children into the Strong-hold of Berren – where time has stopped – and before long they are entwined in a plot to kill the heir to the Faithful Throne. If they want to protect the Young Margrave, and save themselves from an awful death, Duckling and Pummel must learn to use the magic that no one believes in. This is a book filled with epic adventure!! It’s highly recommended to readers who love fantasy adventure and are aged between 8-12 year olds. Even as an adult, I found this book to be quite exciting and a lot of fun to read – I am sure kids will love this!! Special thanks to Allen & Unwin Publishers for sending me an Advanced Review Copy in exchange for my honest review. Girlish: An empowering journal for the twenty-first century girl by Alana Wulff. A great journal every young girl from the age of 9 years old should have – a journal that teaches young girls a sense of empowerment and self-confidence. I think it’s great for young girls to have this book – it’s ok to be smart, it’s ok to go for your goals – don’t let anyone else tell you differently!!! Special thanks to Black Inc. Publishers for sending me an Advance Review Copy in exchange for my honest review. Special thanks to Walker Books Publishers for sending me a review copy in exchange for my honest review. The Secret Throne by Peter F. Hamilton. The Secret Throne is the first installment of the children’s fantasy series: Queen of Dreams. Taggie and her younger sister, Jemima, live with their mum, go to school, play sports and spend their holidays with their dad in the countryside. But one day, everything changes, when a white squirrel wearing purple glasses turns up in their lives. Next minute.. their dad has been kidnapped and it’s up to Taggie and Jemima to get him back. But it seems their father has been keeping some very large secrets from his young daughters and it appears their dad is no ordinary man. Once again I read this one and passed it on to younger readers I know for a second opinion and this one was very well received. It’s an intelligent tale – one that is very suitale to the junior readers as it’s full of adventure and intrigue with underlying words of wisdom that all kids should know. I highly recommend this to junior readers who love adventures and mystery!!! This book is the first of a series that is worth investing in. Peter F. Hamilton is better known for his fantasy fiction/sci-fi stories that target an adult audience however he’s done very well with plot and dialogue with his children’s series!! Special thanks to Pan Macmillan Publishers for sending me review copies in exchange for my honest review. This book is perfect for those who love crime/action books. In the heart of Trenton, N.J., a killer is out to make sure someone gets his just desserts. Larry Virgil skipped out on his latest court date after he was arrested for hijacking an eighteen-wheeler full of premium bourbon. Fortunately for bounty hunter Stephanie Plum, Larry is just stupid enough to attempt almost the exact same crime again. Only this time he flees the scene, leaving behind a freezer truck loaded with Bogart ice cream and a dead body—frozen solid and covered in chocolate and chopped pecans. –Goodreads Synopsis. It’s a good teen book if you’re not someone who finds the love triangles uncomfortable. I was one such person and didn’t like the main character purely because she kept kissing this other guy while she still had a boyfriend! Shocking! but, in her defence, the guy she kept getting tempted by was pretty drool worthy. Despite my dislike of the main characters’ love triangle behaviour, this book was a funny – action packed read and went in so many different directions that I was left clueless about who the murderer was!!! I absolutely loved the best-friend, she’s described as a retired “ho” turned bonds enforcement officer who loves to bedazzle things and shoot movie auditions with a midget she hates while naked!! Many thanks to Hachette Publishers for sending me an Advanced Review Copy in exchange for my honest review. TIME TO GET YOUR GEEK ON!!! Wow, this book was a lot of fun to read! It was so entertaining from start to finish, I virtually smashed this book in about 2 days! I love reading stories that are set at what I call “geek conventions” as I am big fan of pop culture myself so I really get wrapped up in entertaining reads like this one that follows BFFs Charlie, Taylor and Jamie who go to the SupaCon with expectations of an epic time but what they don’t expect is it will change their lives forever. I found it easy to place myself with the characters and following their journey in this book even though they switched from one character to another throughout the story. What I found unique and quite clever about this book was how the relationships between the characters were beautifully woven into the story and the strong representation of diversity within the characters. A fun, humorous story relating to strong friendships regardless of diversity and covers important themes through a positive story. Here’s a quick Q&A with the talent behind “Queens of Geek” Jen Wilde!! What kind of research was involved in writing Queens of Geek? A lot! I spent hours and hours researching everything from lines at conventions to character stereotypes and tropes to avoid. I watched YouTube videos and read blogs and found twitter chats about writing different characters. I read up on autism and anxiety too, because even though I am autistic and anxious, my experiences are not the only experiences of it. I listened to what other writers and readers were saying about both harmful and positive representation and applied it to my work. There’s a wealth of knowledge out there for writers and I think I must have devoured it all, and still do. The book cover for Queens of Geek is GORGEOUS. How much of a say did you have in the final cover?Thank you! I’m obsessed with it! The designer came up with four amazing covers, and then Swoon Reads opened up voting so people could choose their favorite. This cover had my heart from the moment I saw it, so I was secretly hoping it would get the most votes, and it did! Can you recommend a few LGBT YA novels you’re loving at the moment? Oh, it’s so hard to choose! I love Everything Leads to You, Simon vs the Homo Sapiens Agenda, You Know Me Well, and Juliet Takes a Breath. I’ve also got When The Moon Was Ours, Tash Hearts Tolstoy, and Meg and Linus on my TBR. Special thanks to Pan Macmillan Publishers for approaching me to be part of this Blog Tour and for sending me an Advanced Review Copy in exchange for my honest review. The Geek Girl Series instantly transports me back to high school and all the awkwardness around social situations and life in general. Head Over Heals is one of my favourite books in the Geek Girl series. Harriet is still as awkward as ever but it was nice to see her mature and learn to think of others (not an easy feat for 16 year olds). Harriet is awkwardly stumbling her way through life which is very relatable. She is trying to balance family life, school friends and work drama, drama which is often a result of her social awkwardness. Although I feel like the character Rin was a stereotype, overall I enjoyed this book and watching Harriet grow. Also, Jasper is a sweet cinnamon roll, but I feel like I might be in the minority as other fans eagerly await news of N-never mind! Special thanks to Harper Collins Publishers for sending me a Review Copy in exchange for my honest review. 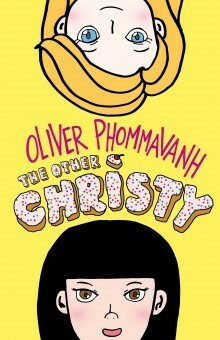 Oliver Phommavanh has just released a new novel for kids “The Other Christy” and I had the privilege of reading an Advanced Review Copy and interviewing Oliver for our blog – he’s awesome btw – before we get to the interview, here’s some light on “The Other Christy”. Highly recommended to a younger reading audience aged 8-12 years old, I still enjoyed this book as an adult. Christy Ung, a quiet, reserved girl has always been known as “The Other Christy” while being in the same class as the “loud-mouthed” Christie Owens – the most popular girl in school. Christy Ung migrated to Australia from Cambodia and struggles with daily life as she is still a loner at school. Adjusting to Aussie life is hard enough especially when living with her traditional and clean freak Grandpa however with the help of her Aunt Mayly, Christy soon discovers when baking a cake to share with her class on her birthday, you can exhibit a positive charge to win in a negative field when you feel the world is against you. A cute, heart warming and funny read that is suitable and recommended for a younger audience. A great story about a girl called Christy – the other Christy as there are 2 in her class. A story of friendship and great lessons – highly recommended as a light hearted fun filled read that I rated 5 stars!!! Thankyou Penguin Random House Publishers for sending me an Advanced Review Copy in exchange for my review. Who is your target audience for “The Other Christy”? Kids aged 9 and up, but anybody will enjoy this book. As an adult, I thoroughly enjoyed this book and I recommend it to all readers of all ages as it really brought back memories of primary school. What was your inspiration to write this book? As a teacher, I’ve taught shy students in my class who don’t have many friends, but when they do come of out of their shells, they attract like-minded people. So I wanted to write a story for the shy kids out there, to speak up and be heard! I felt there were nice lessons to be learnt in this book, for one – I learnt that exhibiting a positive charge in a negative field can help you win in difficult situations. What do you want your readers to get out of this story? It sounds like a cliché but being yourself is the best way to make friends, or more importantly to keep friendships strong. If you’re just pretending, chances are, you’ll be found out and it won’t last. True story, I had the title in my head ten years ago. I had a crush on a girl named Christy back at university, and there was another girl with the same name that hung out in the same group. The Christy that I liked was never around, so I’d always ask, ‘where is the other Christy?’ When it came to writing the story, two girls with the exactly the same name was never going to work, so I tweaked one of the names. Christy appears to have trouble fitting in, in her class – do you see much of yourself or your childhood in Christy? Christy and I share the same weird slant on life. While I was a class clown at school, I wasn’t popular. I was just that loud random kid who said funny stuff. So I found making real friends kind of hard. There were people that I would talk to at school, but that was it. Just like Christy, I wanted a friend outside of school, hanging out. This is clearly a story about self-discovery, growing up and friendship. Would you yourself have adopted Christy’s methods in her efforts in trying to make friends? I think I would. Auntie Mayly offers Christy some heartfelt advice that I would gladly give to anybody who feels like they don’t fit in. I think about all the friends I’ve made, and they were simply by one or two common interests and some kindness. A smile here and there. Just being grouped together in a class isn’t enough, there needs to be some chemistry to spark friendships. Christy’s Grandpa is hilarious, in a story it’s funny how he’s such a clean freak and over protective although in real life, I think I would find him overbearing (lol) but I also felt sorry for him as he was burdened with a task of raising his granddaughter in a world that is foreign to his Cambodian traditions. I am wondering, what was the inspiration for “Grandpa’s” character in this story and whether he is anything like your own Grandpa? He is very much based on my father in law! My grandpa passed away when I was five, but I’d imagine he’d also be as steely and stubborn when it comes to family traditions. My father in law’s quirks and weird habits were priceless material, but I also wanted to show his funny and sensitive side. He really does cherish his daughter (my wife) and wants to protect her, especially when they’ve just settled in a new country. Why was cake the means to ‘win people over’? Food brings people together and it’s the currency used in Christy’s class. I remember teaching a class where kids would try to outdo each other with their birthday cakes that were brought in. I put on six kilos haha. It’s particularly more important for Christy because baking is her passion, so her talent and self-worth is on the line. She really is serving a slice of herself to others. Do you feel the reason why Christy was an outcast in her class was due to her ethnicity or cultural difference or was it more of a personality difference? I wanted to make sure it was personality, because Christy used to be in an ESL class with other migrant kids, and they all made friends except for her. If ‘The Other Christy’ was going to be turned into an adaptation – would you prefer TV or film? Why? We are living in another golden age of television, so I’d love to see it as a mini-series, where each key moment is built up over every episode. Plus there’s more scope to throw in a few other side stories too. When you’re not writing – what would you be doing? Playing video games. I’ve sunk 100 hours in Xenoblade Chronicles X on the Wii U and my 3DS is my travel buddy. What other books have you written? I love burgers (check out my Instagram @oliverwinfree) and my favourite burger chain is Grill’d at the moment. Just wholesome burgers with some great chips on the side. Cast your mind to 10 years ago, would you have pictured yourself publishing your first novel back then? Funnily enough, it was exactly 10 years ago since I quit full-time teaching. I gave myself five years to publish my first novel, so yeah I was determined to make it. Do you like reading? What is your favourite genre? I’ve always been a lifelong reader, my favourite genre is contemporary stories, especially with comedy thrown in. Can you remember the first book you ever read? What was it? I think it may have been a Dr Seuss or Golden Book, but just can’t make out the title. If you could be a character in a video game, who would you be and why? My hero is Sonic the Hedgehog, because he’s cool, blue and fast. Three things I’m not in real life haha. Where is your ultimate holiday destination? It was Japan for awhile, but now it’s America, for the food, the oversized shopping malls and American brands. My all-time favourite artist is Michael Jackson and my favourite song ever is Black or White – yes I still listen to this song on my iPod. What is your favourite type of music/who is your favourite singer? I still listen to my cassette Walkman and have over 100 albums on cassette. I thought StarLord from Guardians from the Galaxy would start a revival but anyway, I do still have an i-pod classic too. I love pop music, boy bands have always filled my playlist from the Bee Gees to the Backstreet Boys and ID. My favourite singers include John Mayer, Eninem, Justin Bieber and Drake. As an author, what was the best piece of advice you were ever given? Just write. Don’t wait for inspiration. Just write! Ice cream or Ice Block? Ice cream for sure. Bungee Jump or Sky Dive? Haha, I’m scared of heights. I suppose sky dive because at least I have a parachute. Famous last words: Whatever man, I’m just doing this for the lols. This was a crack up!!! A unique and incredibly entertaining read.. It would have to be one of the feel good reads of the year and a book I can see transform into a comedy movie..
‘Attachments’ brought back fond memories of my youth in 1999 when the world was going into the new millennium and the panic of Y2K was upon us.. Told from 2 different perspectives, at one stage you’re reading intercepted email conversations between 2 besties in the office, next you’re reading from the perspective of the I.T techo who monitors all workplace emails and the awkward moment when he stumbles across the conversation the 2 besties are having… about HIM!!! Hilarious, entertaining… such a feel good romantic comedy.. It will make you think twice about the email conversations you would want to have in the workplace.. I recommend this to anyone who has had a rough day and needs a laugh.. great book!! !